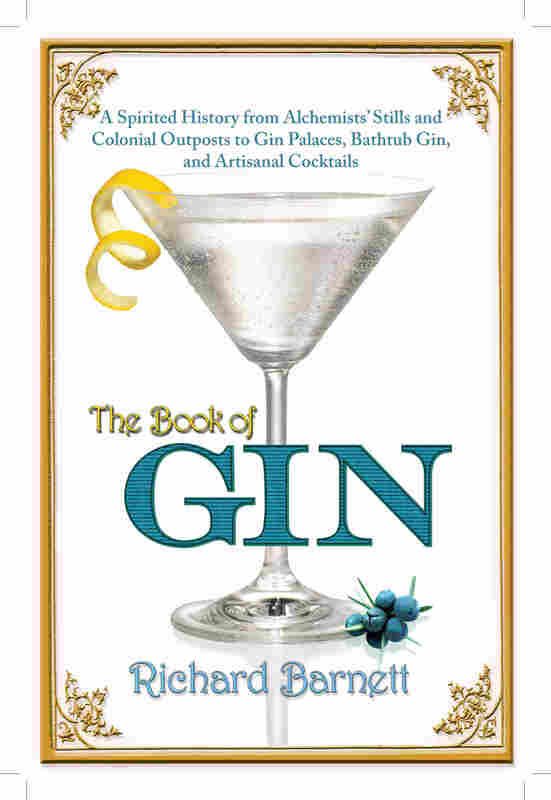 Interview: Richard Barnett, Author Of 'The Book Of Gin' | 'Book Of Gin' Distills A Spirited History From medieval medicine to 18th century English "crack," gin has come a long way. But according to Richard Barnett, author of The Book of Gin, now is "the best time in the last 500 years to be drinking" it. Unlike a good martini, the story of gin isn't smooth; it's long, complex, sordid and, as Richard Barnett has discovered, it makes for tantalizing material. Barnett's newly published The Book of Gin traces the liquor's life, from its beginnings in alchemy to its current popularity among boutique distillers. Barnett joins NPR's Renee Montagne to discuss the medicinal origins and changing reputation of gin. "The whole idea of distilling spirits really comes out of the tradition of, strangely enough ... Arabic alchemy. If you went to Baghdad, of all places, in the 8th or 9th centuries, you'd have found an absolutely thriving culture of research, people trying to investigate the nature of the universe and study it in different ways. Distillation became a really powerful technique for doing that. And a lot of the alchemists think that when you distill wine or beer or spirits in some kind of way, what you end up with is almost the human life force. You get people calling it aqua vitae, the water of life. And then when this liquor starts to be mixed with juniper berries — juniper has had a very long medical history, especially for the problems of childbearing. So you have these very potent medicinal substances coming together in gin, and for a long time it was thought of as medicine." "Well, it all comes down to high politics. In 1689 in [England], we have what's called the Glorious Revolution: The old Catholic King James II is booted out, and a Protestant king, William of Orange, who's Dutch, is brought in. Now, when William of Orange comes to the throne, he knows that he's dependent upon a whole lot of aristocratic supporters. Now these people, in turn, are dependent for their income on the massive agricultural estates they've got. So William knows that if he wants to keep his throne, what he has to do is keep the price of grain nice and high. Now one of the first ways he tries to do this is to deregulate British distilling. Pretty much anybody can start distilling; it opens up a new market for grain; gin suddenly becomes incredibly cheap. Anybody can make it, probably anybody can afford it, and this is what starts to push its reputation down." 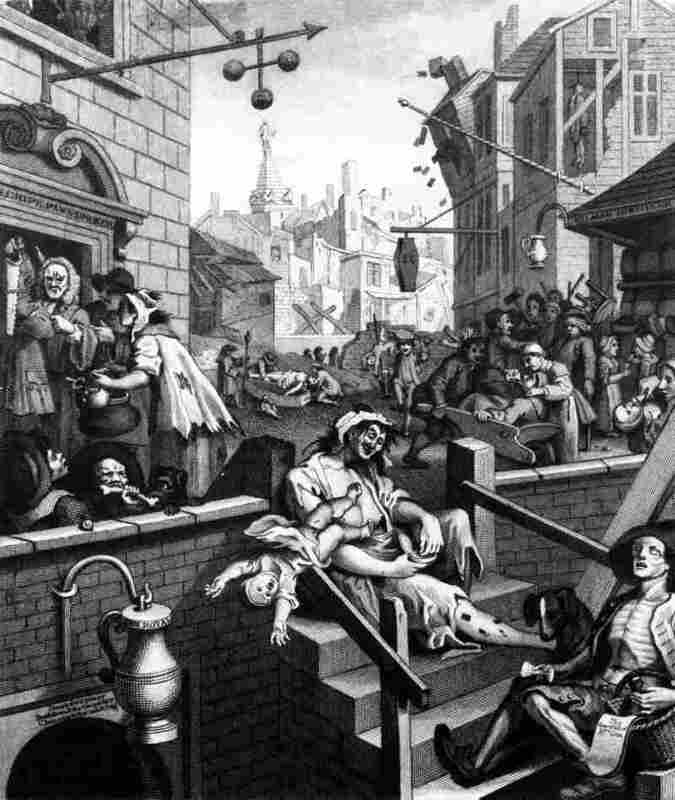 William Hogarth's Gin Lane (1751) was part of a campaign to reduce gin consumption in England. "This is a period between about ... 1720 and 1750. There's a huge amount of public disquiet, not only about the low price of gin, but the social effects that this is having. 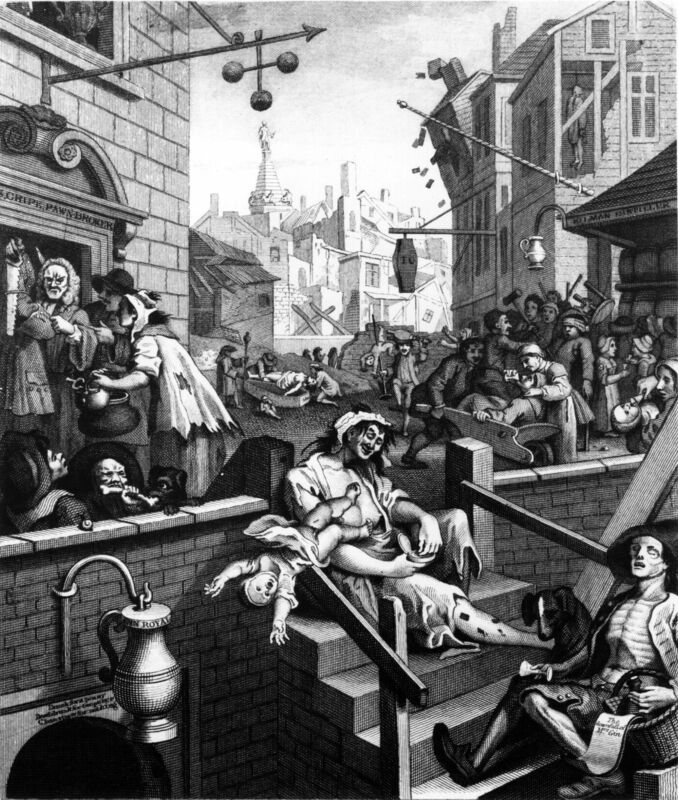 Probably the most famous representation of this is the great English artist William Hogarth produces an engraving called Gin Lane, which is a terrible image of the social breakdown that's being caused by gin ... In fact, if you wanted a very good modern parallel for the way that gin was regarded in the 18th century, crack is probably a very, very good one. And Gin Lane really does capture this in appallingly gruesome detail. All sorts of images of death and social breakdown and madness being caused by this spirit." "Firstly, we should say ... a very important American invention, possibly one of the great American cultural contributions to the world, is the invention of the cocktail. 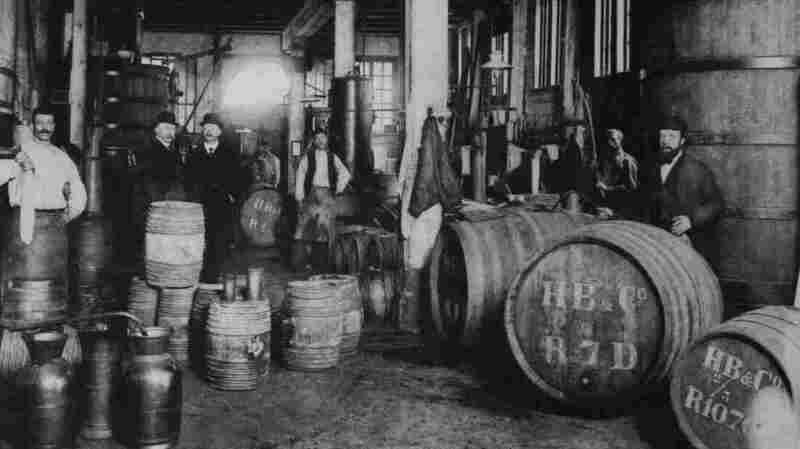 Through the 19th century, first of all Americans, then Europeans, get the habit of drinking spirits mixed up with the whole happy hour of other things: bitters and tonics and all sorts of things. And that helps to make gin more respectable. It's just one more ingredient in the cocktail cabinet. "I think the second thing that helps to make gin more respectable is the growth of the gin and tonic. If you imagine colonists from Europe going out to the tropics in the 19th century, one of the biggest problems they face is malaria — terrible, terrible disease, kills many thousands of Europeans and, of course, many hundreds of thousands of Africans in this period. Now, at the time, there's only one effective treatment, and that's a drug which in Britain is called quinine ... It's derived from the bark of a tree that grows in South America. Now the trouble with quinine is it's incredibly bitter; it's like chewing coffee beans. So in the 19th century, lots of companies start producing more palatable ways of taking your daily quinine — this is tonic water. "Now, British colonists in the late 19th century discover that tonic water and gin sort of complement one other. They've both got this rather sort of refreshing botanical kind of flavor. So the British start drinking the gin and tonic, and making it the distinctive drink of British colonials. And they bring this habit back to Britain in the, I suppose, in the 20th century. So those are the two things that start to make gin a much more respectable prospect." "Well, pink gin again speaks to this rather wonderful global history that gin has. Pink gin is a combination of gin and bitters. Now, bitters were invented essentially in the 18th century as a kind of remedy for seasickness. So again, you've got this idea of sort of global trade and exchange; people going all around the world taking gin with them, and then using it to sort of mix up their own home remedies. And pink gin became the classic drink of the British Royal Navy. "Now, the Kublai Khan No. 2 is a rather different prospect. Whether this was actually made is not something I think we're sure of. We find this in the writings of the great occultist, Aleister Crowley. Crowley tells us in his writings that he would go to a certain pub in Bloomsbury in London and order what he called a Kublai Khan No. 2, which he tell us was a mixture of gin and laudanum. Now, laudanum is essentially the earliest version of a sort of general painkiller. And it's opium, so not far off heroin, dissolved in sherry. So if you imagine a kind of heroin martini, this is what Crowley tells us he was drinking." "In the U.S., I think, Prohibition itself has a strange and rather paradoxical role in making gin a more respected and a more democratic kind of drink. If you think about the speakeasy, it's a very — although it's an illegal space — it's a very democratic space. The speakeasy is one of the first places in Western culture where you get men and women drinking together for the same time. You get social boundaries being crossed. You even — very rarely at this time in American culture — get racial boundaries being crossed, as well. So, the speakeasy starts to help to make the cocktail and the ingredients that go into a cocktail sort of respectable prospects, as it were." "Now is probably the best time in the last 500 years to be drinking gin. I think you've got a better quality and certainly a much wider diversity of producers and flavors going on. I think it really started in the — I think it would have been the very late '80s, when Bombay Sapphire appeared on the scene. For about 20 or 30 years, gin had really sort of been in decline. It was becoming a sort of more industrial, more standardized product. But with the appearance of Bombay Sapphire, you get the idea of a boutique gin. And that's kicked off an entire sort of renaissance in the production of gin. Suddenly, you've got many, many smaller producers setting up on a kind of boutique craft level, producing their own distinctive spirits."